Please see below for complete details. Arm Restraints Manufactured and Certified to SFI Specification 3.3 by RJS and equipped with snap-clasp type tethers have been found to be non-compliant with SFI Specification 3.3. 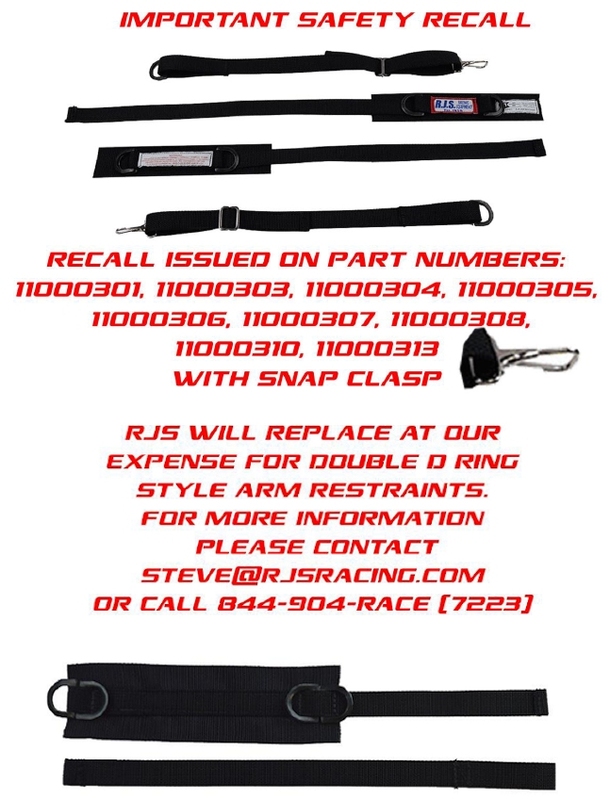 All snap-clasp type Arm Restraint Assemblies Manufactured and Certified to SFI Specification 3.3 by RJS must be immediately be removed from service and returned to RJS, per the attached notice from RJS. This recall only includes RJS Arm Restraints with snap-clasp tethers. RJS Arm restraints with double “D” ring tether attachments are not affected by this recall.